Do you think your bathroom could do with a fresh new look? However, you don’t want to rip out any walls or undertake any extensive renovation work in the process? Your best option is to select one of the many no-fuss products for exposed installation from hansgrohe. These mixers and shower systems will make your bathroom both high-tech and visually striking. They will also quickly transform showers and bath tubs into feel-good spas. 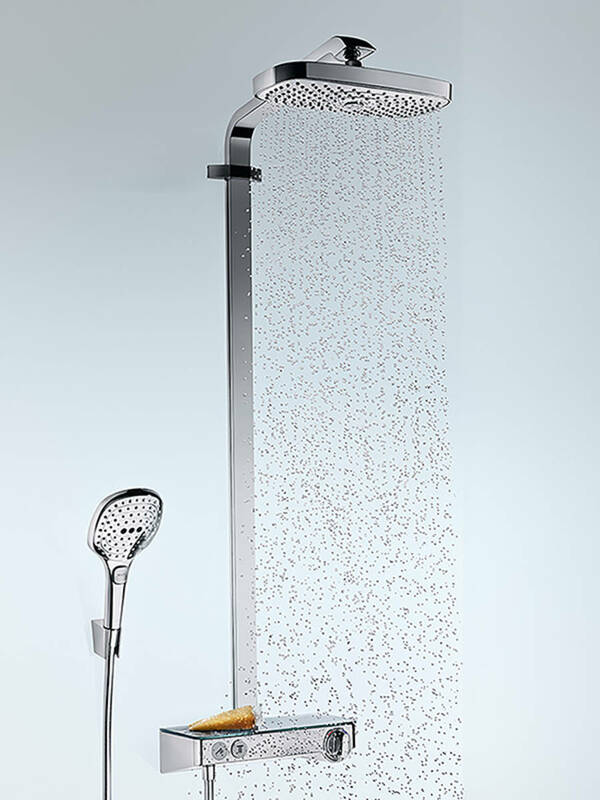 The classic installation option in the shower is: an exposed thermostatic mixer and hand shower. In the bath tub, add in the bath filler. However, would you like to enjoy more features or have you always wanted a large overhead shower? If so, a shower system would be your best option: for more comfort, more shower and more fun with water. On this state-of-the-art unit, which consists of an exposed thermostatic mixer, overhead shower and hand shower, everything matches seamlessly in terms of its design and function. These all-in-one systems are attractive if you want to modernise your bathroom without any hassle: simply install the exposed units on existing connections. The connection dimensions are standardised, so all hansgrohe systems will fit in your bathroom. Even if you live in rented accommodation, the upgrade is worth implementing, because exposed installation non-thermostatic and thermostatic mixers and also shower systems can be dismantled just as quickly. How does concealed installation work? Integrating your thermostatic mixer(s) into the wall so that they are flat and seamless saves space and makes for an elegantly understated look. This minimalist design offers you more space to move around when showering or bathing. Installation is somewhat more complex, because the technology is installed in a base set behind the wall. At hansgrohe, you will find exposed installation mixers to suit any preference, any bathroom setting and any budget. They will all provide you with loyal, reliable service. You can even use some to create your dream bathroom, which will make you the envy of others. Here you will find a breakdown of products, which is intended to assist you with your selection. In each case, hansgrohe offers a wide variety of ergonomic handle and design variants as well as a variety of surface finishes. These hansgrohe products are exceptionally quiet. This is down to our extensive expertise and, for example, built-in silencers. Shower and bath mixers offer you the easiest way to control water. From unobtrusive basic models through to imposing luxury mixers, you can find everything you need at hansgrohe. 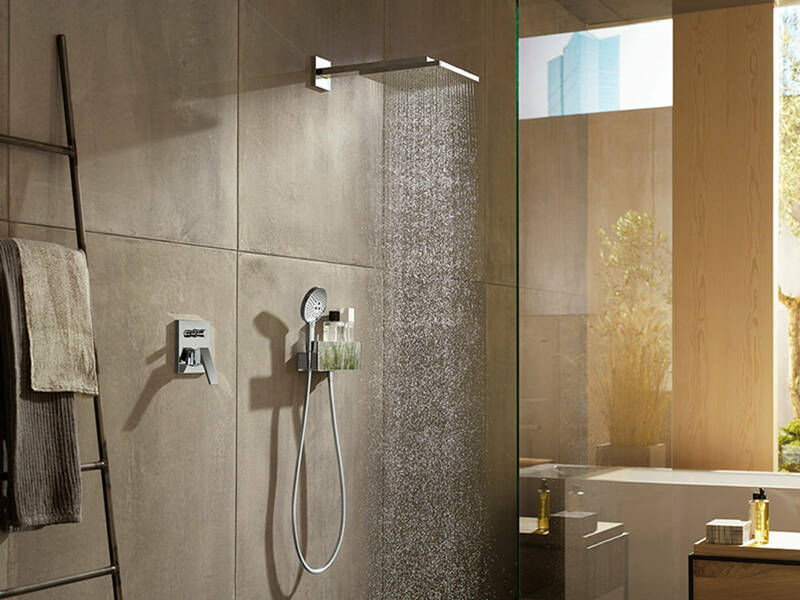 Here’s a tip: combine your new mixer with a hansgrohe hand shower and shower rail from the same style collection. Exposed thermostatic mixers are equipped with technically complex inner workings. They regulate the water temperature reliably and constantly. This offers you maximum comfort in the shower and bath tub, and protects you from any unpleasant fluctuations in temperature. hansgrohe thermostatic mixers comply with high standards of safety, providing you with reliable protection from heat and impact injuries: for example scalding protection thanks to a safety lock at 40°, an insulated body with rounded corners and adjustable temperature limitation. Opting for our exposed installation shower system can solve lots of bathroom issues for you: you can get an overhead shower without having to rip out the wall. Enjoy a wonderfully varied shower experience with up to three jet types on the hand and overhead shower plus convenient water control. All this can be experienced just with one simple model. The pipes are situated too deep in the wall? No problem. The retail market offers appropriate extensions in any installation length. So you can install your new mixer without a problem. The pipe in your wall runs at a slight angle? No need to worry. 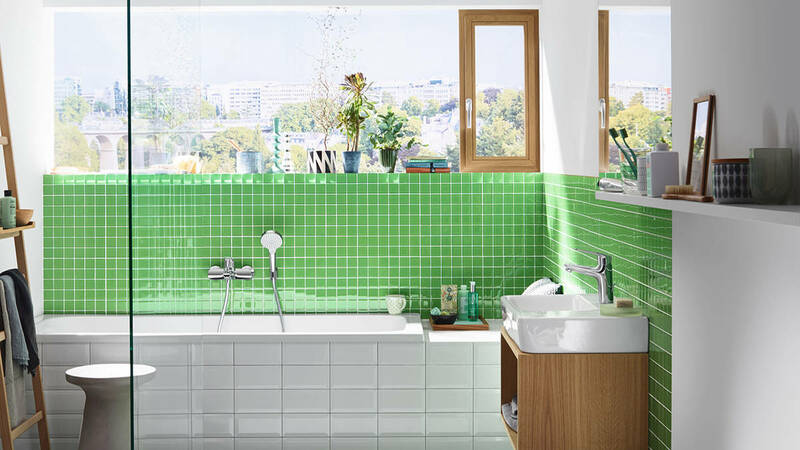 With hansgrohe models, minor imperfections can be compensated for by the included connections. 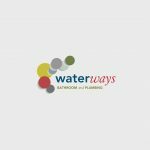 You have a continuous flow heater or storage water heater? That’s no obstacle. Depending on the model, hansgrohe mixers and showers function with lots of hot water supply systems. How long does the guarantee on your product last? hansgrohe offers you a 15 year voluntary manufacturer’s guarantee. Your product is significantly older? That doesn’t matter. If, at a later stage, something develops a fault or becomes leaky, we have spare parts which you can replace easily (using standard tools).